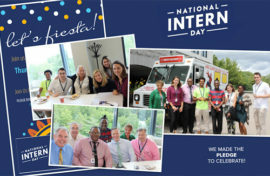 Braintree, MA (August 9, 2018) – Peabody Properties recently celebrated National Intern Day on July 26. 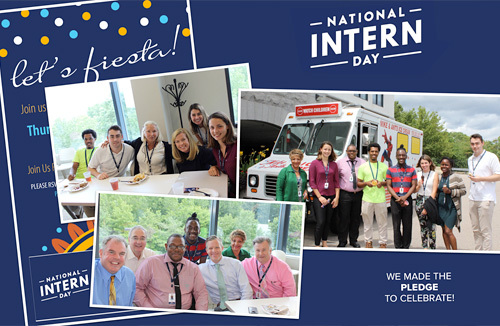 National Intern Day is a dedicated day for employers to recognize and celebrate hardworking interns across the nation. WayUp, an organization focused on connecting employers to students and recent graduates for internships and jobs, started the initiative last year. To celebrate the day, Peabody Properties hosted a “Southwest Style” lunch in honor of the interns. Peabody Properties is working with twelve interns this summer, in a range of positions from marketing and resident services to property management and facilities management, and representing a range of schools and towns. They include Gayle Perry of Walpole, Megan Dixon of Hanover, Kurt Bailey of Boston, Marcel Furtado of Whitman, Derick Jacques-Simon of Brockton, Meghan Ormsby of West Springfield, Elizabeth Similien of Beverly, William Jessup of Westwood, Almalinda Diaz of Boston, Dinah Salomon of Sharon, Brendan Welch of Easton, and Teodora Padure of Braintree.